Occasionally we get to step outside the usual San Diego Wedding photographer box and do something unusual. Sometimes, that comes as an opportunity to work with a magazine as the catalyst. That's the case here. We were asked to shoot a Steampunk themed wedding set up for San Diego Style Weddings. We were thrilled to do it, we've long admired the look of Steampunk and were excited to not only capture this look but to work with other vendors who shared the same vision. This image is of one of the two cakes that French Gourmet made for us that day. It has a lot of detail and was really fun to take photos of! 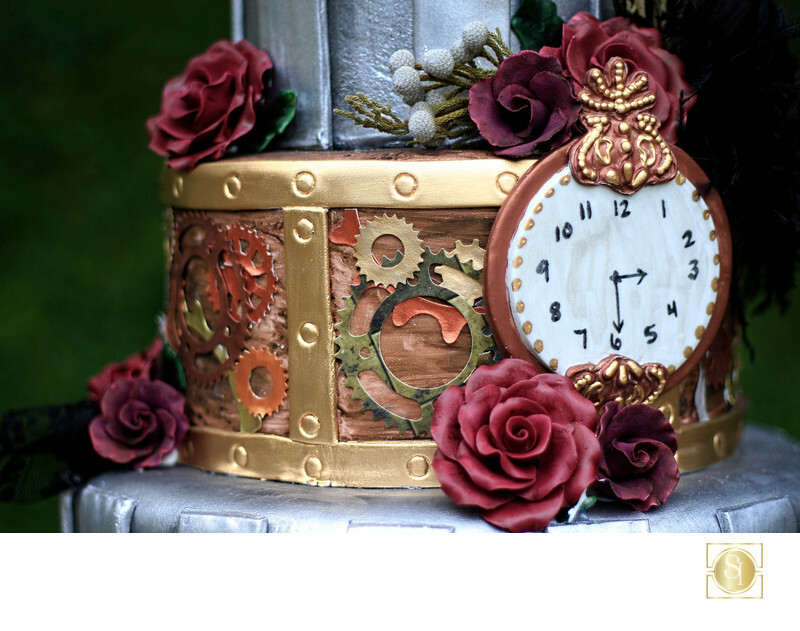 The fondant has a real metallic look, the gears are so authentic looking and the clock looks like it should tick! Shot with our current favorite camera, the Canon 5D mkIII and a Canon 24-70 f2.8L lens, the color and contrast, I think, are stellar, as is the sharpness. We use the best equipment we can get so that our clients get the best images they want! Keywords: Best san diego photographer (3), Los Willows wedding Estate photographer (30), steampunk wedding photos (6).